Aluminum chloride hexahydrate concentration-dependently inhibits perspiration and is highly effective in palmar and axillary hyperhidrosis. The main effect is in the sealing of the sweat glands, the precipitation of aluminum-mucopolysaccharide-complexes and the damage to the epithelial cells in the excretory ducts of the eccrine sweat glands result in sealing of these ducts. Other aluminum salts, such as alum (alum deodorant stick) or methenamine release formaldehyde in acidic environment. Because of this, proteins are precipitated and it comes to closing the sweat glands. Less frequently, welding synthetic tanning agents such as Boric acid, resorcinol, tannic acid or potassium permanganate are used in the external treatment. is a paste ointment containing the active ingredient methenamine and is used as antiperspirant on weeping foot skin - especially between the toes . - but also applied at hand and underarm sweating Antihydral ® dries to the same extent as excessive sweat is secreted. The sweat secretion is not suppressed but normalized. Ansudor ® N is an antiperspirant for external use on the skin with increased perspiration. Even when perspiration increases in body folds , such as those that occurs at obese individuals , Ansudor ® N can be applied. The decreased perspiration reliably prevents soreness in body folds and friction sores . Ansudor ® N has next to the antiperspirant effect also antibacterial effects. So the unpleasant and annoying body odor which commonly occurs with increased sweating, and which is caused by bacteria can be prevented. By using the Essitol ® tablets (active ingredient: aluminum acetate - tartrate) produced, externally applied lotion is used for, inter alia, application as a mild medicine for excessive sweating . The lotion prepared with Essitol ® tablets for brushing or swabbing with excessive perspiration can be used long term. is a herbal and a mild-acting remedy that regulates perspiration gently. The dry extract of sage supports the contraction of the sweat glands and thus reduces perspiration . It contains sucrose (sugar) , glucose, and lactose . The small coated tablets can be easily and unobtrusively taken and cause an antiperspirant all over your body . 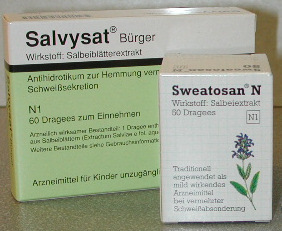 The agent contains herbal ingredients of sage, such as as tannic acid and rosemary essential oils . The agent inwardly causes to inhibit the sweat- and mammae-secretion. Externally, in the oropharynx, the rosmarinic acid has an astringent effect on the mucous membranes , antibacterial and engages in inflammatory processes , while the essential oils disinfect and help the blood circulation , so that inflammation can be inhibited quickly and healing promoted . To provide an antiperspirant effect , the agent must be taken over a longer period of time. 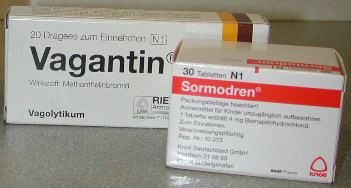 Both drugs belong to the group of anticholinergics . Those are drugs that suppress the action of acetylcholine (ACh ) in the autonomic nervous system by inhibiting specific receptors. Also, atropine or oxybutynin inhibit cholinergic transmission to sweat glands and thus the sweat production . As in the above enumerated preparations, side effects such as blurred vision, dry mouth , constipation and urinary retention are possible. Limitations and drug interactions must be considered. Atropine as well as oxybutynin may be applied locally also, such as a combination therapy with the tap water - iontophorese. Among the best known means to regulate and manipulate the soul-spiritual being, also include the so-called beta-blockers that are missing in almost no medicine cabinet and their function has been started already at presentation of anticholinergics . Beta - blockers were given their fame due to their spontaneous reaction force and the fact that these little pills, in contrast to the tranquilizers , are accompanied by only a few side effects in almost the same therapeutic effect. A foolproof application and the immediate loss of restlessness and agitation contributed to the popularity of this group of drugs. Especially in terms of hyperhidrosis, these chemical pills will usually appear without much delay on the doctor's prescription pad , because the active ingredient of the beta - blocker intervenes directly in the psycho- neural budget and restricts vegetative reactions . It is known that in anxiety and stress situations, that may be the primary trigger of excessive sweating, hormones are released. In particular, the stress hormone adrenaline plays a decisive role. This hormone stimulates the beta receptors of the nerve cells, causing the physical state of arousal caused . If it comes to hormonally induced stimulation of these receptors, anxiety symptoms are produced. For hyperhidrotics, this irritation discharges through a hypersecretion of the sweat glands. The relaxation technique of autogenic training (short: AG) is probably the best known approach, with only minor expenses to attain physical well-being. It was reported and written much about the issue in the past, which can be also considered as an indicator of not more undeniable healing effect of this self-training. On the other hand symbolizes the increasing awareness and the increasing interest in autogenous training but also in today's inflationary re expansion of stress and tension at work and in everyday life. The process of AG counters stress and anxiety with a high efficiency, so also the hyperhidrotics should definitely deal with this relaxation technique, because anxiety and stress can be main factors for excessive sweating. Autogenic training is a kind of art of deep relaxation, in effect similar to a sound sleep state, but which is consciously felt and perceived by AG. The sleeping process, however, with its peculiar processes of dreaming, more runs on an unconscious level. The AG serves primarily prophylactic purposes. With a rapid "switch-off on command" , it is possible to be prepared for appealing and very often over - demanding tasks of everyday life and the world of work, the requirements and the expectations of civilizing bustle to a halt and the highest good of the person whose to protect health with only minor expenses and stabilize .